The adage goes that, in polite company, you should never, ever, talk about religion or politics. This should probably be extended to religion, politics or Poli-Glow, such is the contention, usually followed by a fractious and energetic debate, with the occasional thrown bar stool, that follows it being muttered as a cure to someone’s aged and chalky gelcoat topsides. The assailant with the bar stool will have tales of Poli-Glow gathering dirt, how it rubs off with your fenders, how it breaks to a chalky mess within months, how people have ended up with a terrible finish because dirt has stuck to it on application and then it’s been flipping impossible to remove once you have it on your boat. These observations, warnings and rants (with the inevitable flying bar stools), are all justified and should be carefully listened to whilst you edge towards the exit. A lot of the problems with Poli-Glow can be squarely blamed (as so many other things can be!) on marketing and lack of managed expectations. I have been applying Poli-Glow to Triola, my much loved 1970’s Albin Ballad, for a good eight years now. Her old dark blue gelcoat topsides have needed painting ever since I have owned her, however, I have never had the funds nor the time with which to paint them. 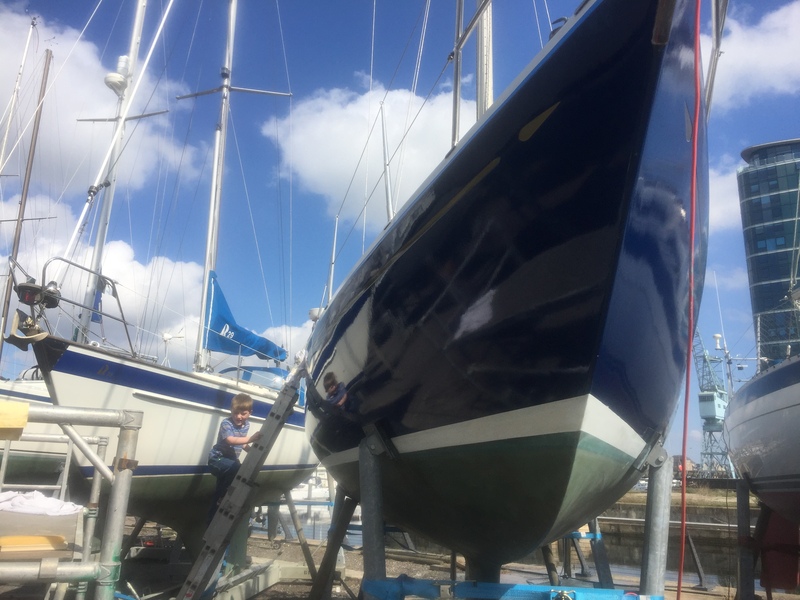 Whenever I would polish her topsides with my big 14” polisher and then wax them, within weeks the UV would get under the polish and the gelcoat under the polish would go chalky and within a month she would look a state again. After much Googling I came upon the rather dubious slogan “MAKE FADED FIBREGLASS SHINE LIKE NEW” on Poli-Glows website. Well, thought I, that sounds far too good to be true, for a mere £80 it must be snake oil. After many years of trial and (much) error, I have Poli-Glow down to a fine art and I must say, with my expectations firmly managed, I love it. Poli-Glow is a product of last resort. 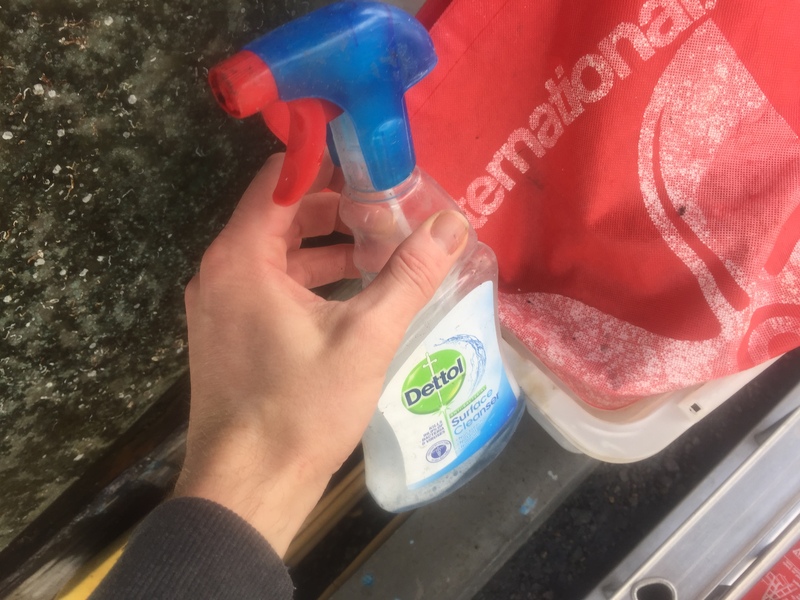 You don’t use it on new gelcoat to maintain it, and you only use it on old gelcoat when it is pretty much completely knackered and polishing is something of the past. It’s a co-polymer protective coating. It’ll create a hard polymer, UV resistant, transparent shell to your gelcoat preventing any more UV degradation and chalking of your gelcoat until the polymer itself breaks down. 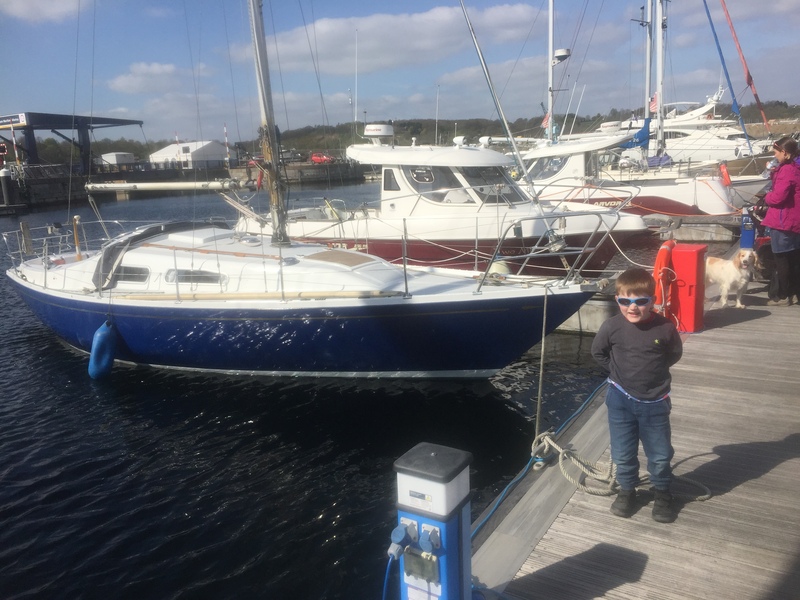 In a marina it will last 9 to 12 months, on a mooring, for whatever reason, perhaps the salt water splashing on the hull or the fact the boat is in the UV all day, it will last a 6 months on a dark hull like Triola before needing reapplication. 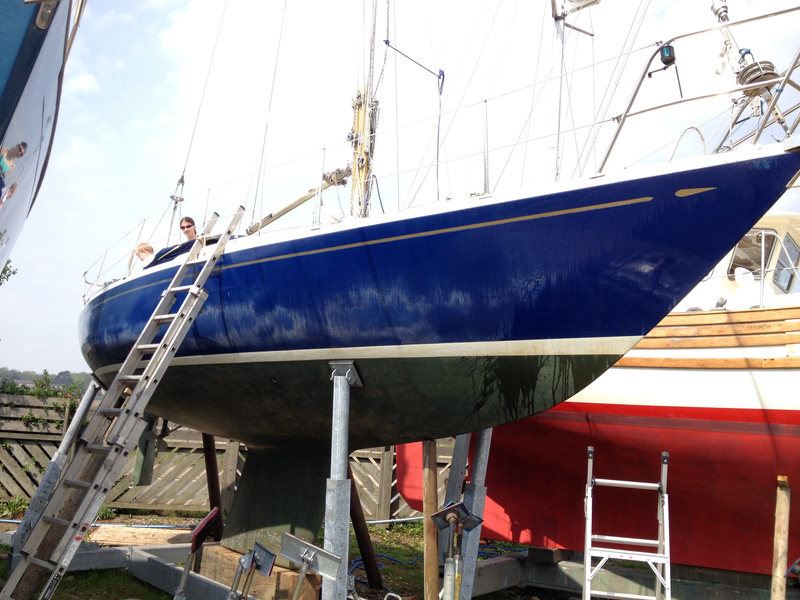 Reapplication can be done from a dinghy on a quiet anchorage from a dinghy, so it’s not necessarily a lift out job. If you don’t reapply within that window, it will start to break down and flake off, making your poor vessel look like it has some grim and terminal form of leprosy and it will need completely removing. After two years, even after reapplication in perfect conditions, it’s usually best to strip it all off and to reapply. Don’t let this put you off, with the correct technique and the right chemicals, you can strip the boat in a morning, and reapply in the afternoon, and the application of this stuff to your boat is a joy. Poli-Glow – This is the polymer itself, think of it like a varnish for gelcoat. Poli-Prep – This is a mild acid with soap used for preparing a boats surface. Poli-Strip – This is effectively paint stripper and will remove Poli-Glow in short order. Poli-Ox – Effectively an Oxalic acid cleaner that comes in a powdered form. This is suggested by Poli-Glow to remove the oxidisation and can also be used to remove other stains such as rust from your boat. 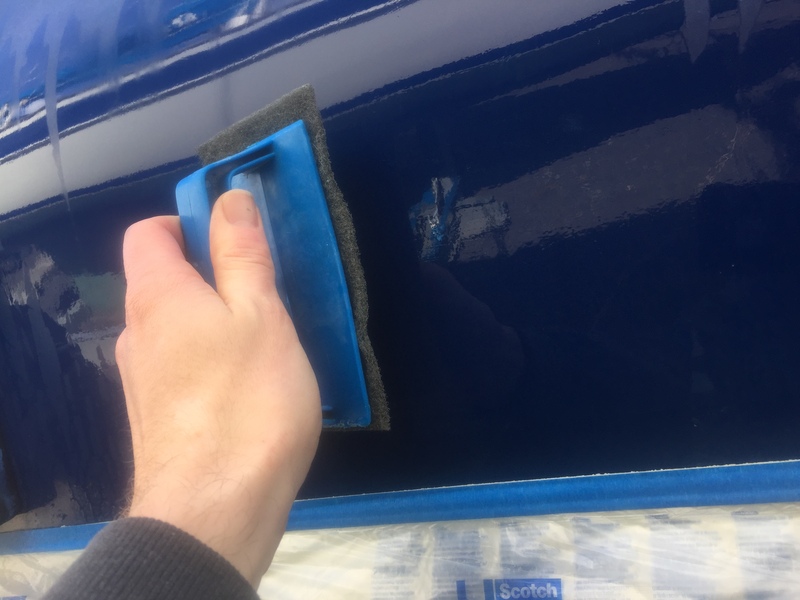 To prepare the hull we need to remove all other waxes, dirt, contamination and any oxidisation (the white chalky surface) of the gelcoat and get it back to a matt, uniform colour. First off, Poli-Prep is acidic so protect your eyes and wear some tough rubber gloves. Poli-Glow suggest using Poli-Prep at a concentration of three parts water and one part Poli-Prep, however, I found it works better at higher concentrations. 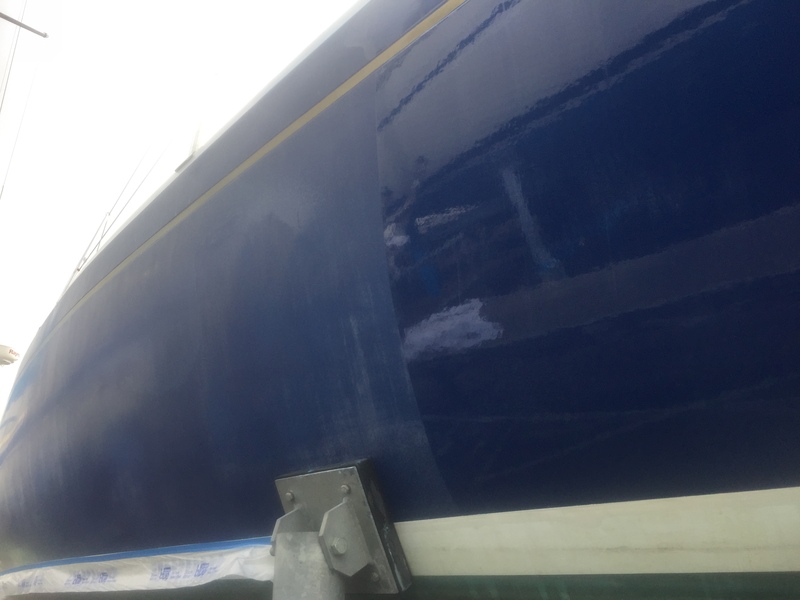 Bear in mind, this stuff will streak and in some cases, remove your waterline antifouling and any other paints it touches, so it’s a good idea to mask up. Put your diluted Poli-Glow mix into a spray bottle liberated from your galley and you will be ready to go. 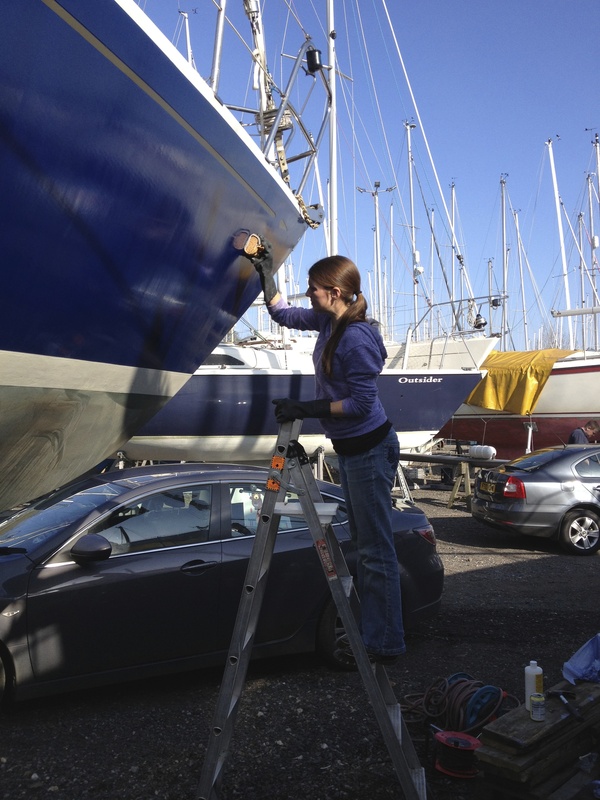 The kit will come with a Scotch-Brite and a scrubbing handle for it, so with a hose pipe in one hand, and the spray bottle in the other, work your way around the boat until all oxidisation and wax is removed and you are back to a solid, matt gelcoat. If you have stubborn oxidisation, Poli-Ox, applied to a wet scotch brite, will help the process. Don’t let Poli-Ox dry on your hull and make sure you rinse it fully and then go over it again with Poli-Prep. 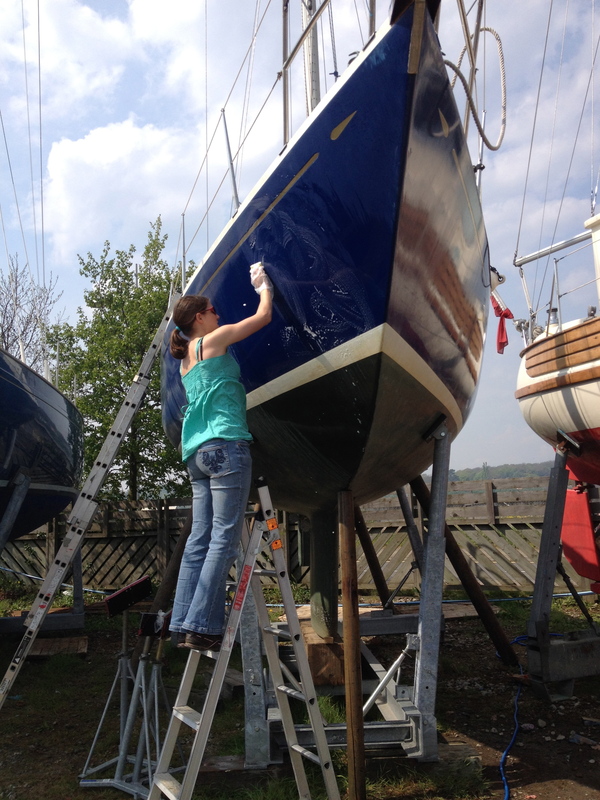 Removing the oxidisation is hard work if your boats gelcoat, like mine, is 40 years old and you may need to go around the boat more than once before all the oxidisation is gone. 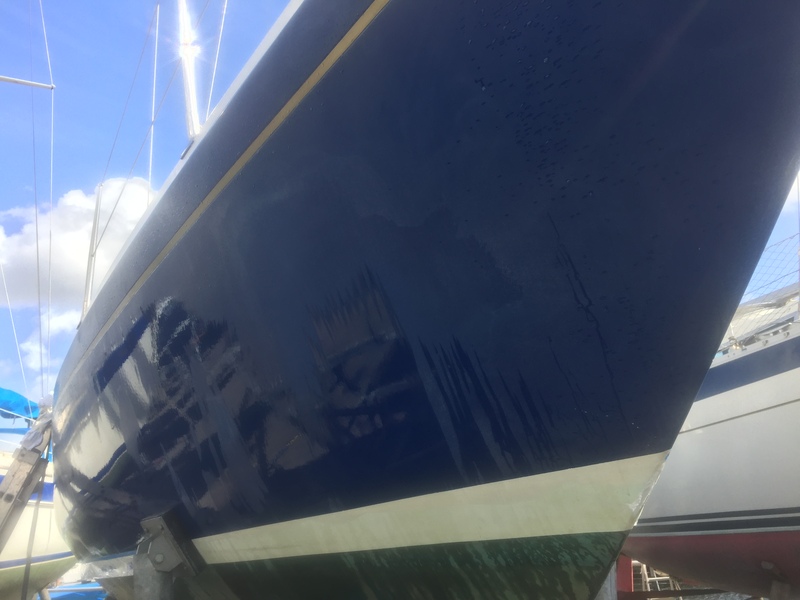 The best way to assess how your end result will look and if you have done enough scrubbing is to wet the hull and stand back, as how it looks wet is effectively how it will remain looking once you have applied the Poli-Glow. So your Poli-Glow has broken down and needs removing and from bitter experience, I can tell you that this can be an infuriating task with the wrong technique and the wrong chemicals. 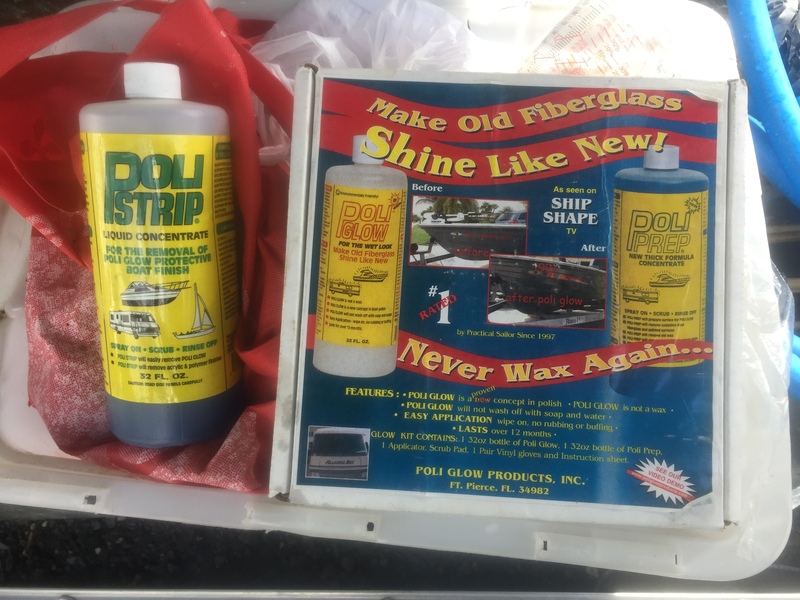 In years gone by, the suggestion from Poli-Glow was to use a higher concentration of Poli-Prep, and at concentrations of 1:1 I could strip the boat in a day with lots of elbow grease. Now, with Poli-Strip, I can strip the whole boat in a couple of hours. Mix it up 2 parts water to 1 part concentrate (no stronger with this stuff) wear some gloves and some goggles to protect your eyes, put your solution in a spray bottle, and get cracking. Bear in mind this stuff will eat through your antifouling too, so mask that up before you begin. Use the scotch brite and handle included in the kit working in about 5 foot square areas. Spray the solution onto the area you are stripping first, rub for a minute with your scotch brite, liven it up with a spray from the hose pipe, rub a bit more, and then rinse off, it’s as simple as that. As you rub, you will note the solution on the hull thickens up as the Poli-Glow breaks down and becomes suspended in the solution. Don’t let it dry as the Poli-Glow will firm back up again and you’ll need to wet and rub once more. Finally, wash it off with the hose. You may need to reapply if you note, when wet, any oxidisation or remaining Poli-Glow on the hull. Finally, go once around with soap and water to remove any residue of acid on the hull. You will now have a clean, mostly uniform, matt, deoxidised surface for your topsides. It may look a little streaky right now and it will certainly not look inspiring, however, do not fret, this is where we begin applying our Poli-Glow. Only start applying this stuff when there is no wind at all, and wet down the ground around the boat just in case. Finally, eye up carefully what is going on in the yard around you. If anyone is about to crack out a sander next door and start sanding their boat, politely ask them to wait until you are done, or bug out entirely until the conditions are more favourable. There can be no chance of rain, as even the smallest of showers whilst the product is wet will destroy your finish (I know this from bitter experience). Use a roller tray and pour some Poli-Glow into it before wetting out the applicator, allowing it to sink in for five minutes to liven up the chammy (or the mit if you are using that option). It’s important the applicator is moist and not dripping wet else you’ll get runs and bubbles. Apply it as if you are wiping on varnish. 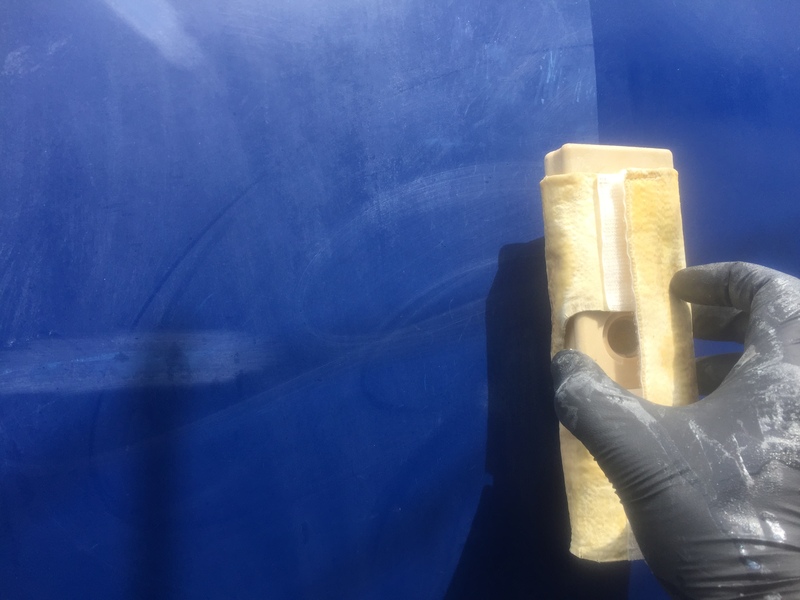 I work in ‘stanchion areas’, applying horizontally along the top of the hull, then above the waterline, and the top to bottom covering the whole area, never applying too much force so as to not create bubbles in the finish. Be sure to not get any Poliglow on your waterline or on your toe rail! I used to rely on a steady hand, I now make sure I spend half an hour masking both up before I begin as once applied, it’s nearly impossible to clear up any over painting of Poli-Glow. Romp around the boat, completing six full coats one after the other. The first coat may go on a little streaky and with each coat it will build on the previous providing a deeper, and deeper shine. It takes about two hours to complete all six coats and what a result, only varnishing tops this for a more satisfying job. Watching you boat transform in front of your eyes is a treat and no mistake. In less than a full day you can strip, wash, and reapply Poli-Glow with the right technique, using the right chemicals, in the right conditions. Manage your expectations that this isn’t a substitute for paint or even polish, and it will rub off on fenders (a quick wash off with a sponge usually brings the surface back again), and it will eventually degrade in 6 to 12 months. Whilst I manage my expectations that this is no miracle cure, I can say it makes her look stunning, for not too much dosh, and until I have time to paint her topsides, and at the risk of a bar stool flying my way, I love the stuff. 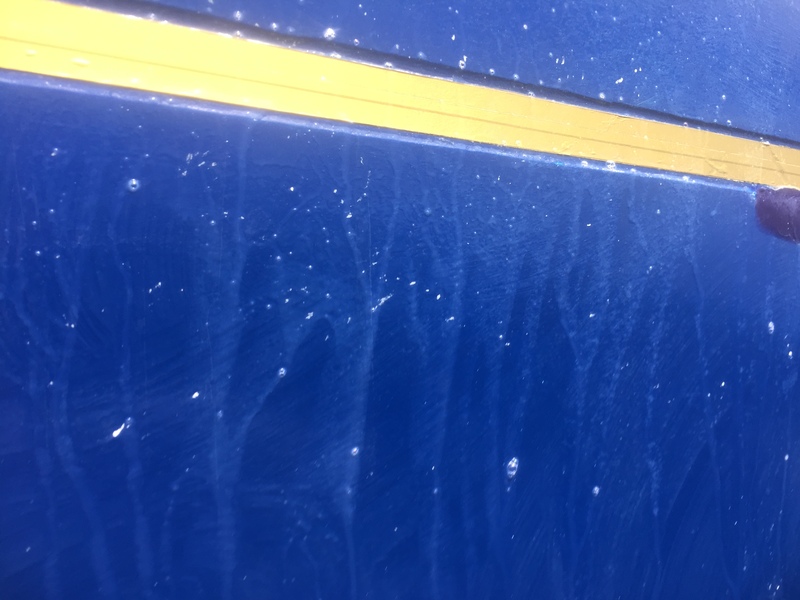 The professionals I have spoken to about Poli-Glow are pretty damning about the product, suggesting that abrading your gelcoat with something like a Scotch-Brite that will make an already porous surface full of scratches is not a great idea. They will also suggest that some modern polishes now offer the level of UV protection that Poli-Glow offers and that by hand, Scotch-Briting a hull in a uniform way is an impossible task. As ever, Caveat Emptor!